The whole course of the ... revolution ... strikingly confirmed one of Marx’s profound propositions: revolution progresses by giving rise to a strong and united counter-revolution, i.e., it compels the enemy to resort to more and more extreme measures of defence and in this way devises ever more powerful means of attack. In fact, some NGOs in the country have been the vehicle for introducing a type of colonial environmentalism that relegates the indigenous peoples to the role of caretakers of the Amazon jungle (considered extraterritorial property of foreign governments and corporations), creating de facto a new relationship of privatization and alienation of the national parks and Communitarian Lands (TCOs) over which the state itself has lost custody and control. In this form, whether by means of the hard power of the property-owning despotism that controls the processes of intermediation and semi-industrialization of Amazon products (lumber, alligators, chestnuts, rubber, etc.) or through the soft power of the NGOs, the indigenous nations of the Amazon are being economically dispossessed of the territory and politically subordinated to external discourses and powers. In short, economic and political power in the Amazon is not in the hands of the indigenous peoples or the state. Power in the Amazon is in the hands, in part, of a landowner-business elite, and in part, of foreign businesses and governments that negotiate the care of the Amazon jungles in exchange for a reduction in taxes and control of biodiversity through their biotechnology. “For the workers, mainly miners and industrial workers, for at least 50 years (1940-1990) the union was the organizing network of class identity and accumulation of experience as a class... the assimilation of class experience came exclusively through the union, and that, in the last analysis, was all the workers had with which to confront life, repression and death. The union was the sole enduring place in which to experience the ups and downs of collective existence; it was the sole ongoing network of support, friendship and solidarity, and the authentic place in which to assert themselves as a collective body. What the workers did in history from 1940 to 1990 was done as trade unionists; the union was the instrument of their struggle, in which they made a revolution (and that is no small thing), they won rights, they won healthcare and housing, they protected their families, they buried their dead. Hence its durability and pre-eminence in the construction of working-class memory....” – Álvaro García Linera, “Sindicato, multitud y comunidad. 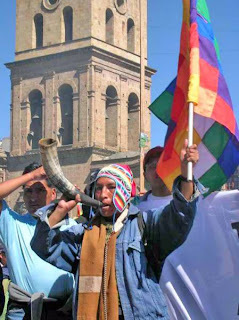 Movimientos sociales y formas de autonomía política en Bolivia,” in Tiempos de rebelión, Comuna y Muela del Diablo, La Paz, 2001. “Two types of social contradictions — those between ourselves and the enemy and those among the people themselves — confront us. The two are totally different in their nature.... In the conditions prevailing in China today, the contradictions among the people comprise the contradictions within the working class, the contradictions within the peasantry, the contradictions within the intelligentsia, the contradictions between the working class and the peasantry, the contradictions between the workers and peasants on the one hand and the intellectuals on the other, the contradictions between the working class and other sections of the working people on the one hand and the national bourgeoisie on the other, the contradictions within the national bourgeoisie, and so on.... The contradictions between the enemy and us are antagonistic contradictions. Within the ranks of the people, the contradictions among the working people are non-antagonistic...” On the Correct Handling of Contradictions Among the People, Speech delivered by Mao Tse-tung, February 27, 1957. CIDOB since its birth has depended on direct funding from international cooperation through NGOs. Thus the NGO APCOB (Apoyo para el Campesino Indígena del Oriente Boliviano) received money from USAID and the Ford Foundation through the NGO Culture Survival in the 1980s for the creation of the CIDOB, as did other indigenous organizations in Peru and Ecuador: Cultural Survival, Final Report, “Strengthening pluralism: a combined human rights/grass roots development program for Indians of Latin America and the Caribbean Basin,” 1987. In the 1990s, the director of IBIS-DINAMARCA said they supported the creation of CONAMAQ under the ethnic model of the CIDOB because they needed an organization of that type in order to be able to work cooperatively. Likewise, the CSUTCB was identified as a class organization with a discourse from the Seventies, with which they could not work. And in an OXFAM document we can read: “The ayllu is a form of Andean organisation [that maintains] principles... opposed to the peasant unions, which are organisational forms imposed on the ayllus [...].” Quoted in Andolina, Robert; Radcliffe, Sarah; Laurie, Nina, Development and culture: Transnational identity making in Bolivia, Political Geography 24 (2005) 678, at p. 695.